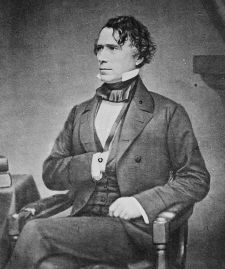 Franklin Pierce (November 23, 1804 – October 8, 1869) was the 14th President of the United States, serving from 1853 to 1857. He was elected to the presidency at a time of tranquility, when by virtue of the Compromise of 1850, the country seemed to have weathered the storm surrounding the slavery issue. When the problem suddenly reappeared during his administration he had little success in dealing with it, and policies he established hastened the disruption of the Union. With roots in the northern, anti-slavery state of New Hampshire, Pierce sided with the South on the issue of slavery. Devoted to the Union of the States, his aim in compromising with the South was to avoid at all cost a break-up of that Union. His views made him unpopular in the North, and he failed to win a second term. Pierce served in the House of Representatives and Senate as a Democrat. He took part in the Mexican-American War, becoming a Brigadier General. His private law practice in his home state of New Hampshire was so successful that he turned down several important political positions. Later, he was nominated for president as a "dark horse" candidate on the 49th ballot at the 1852 Democratic National Convention. In the presidential election, Pierce and his running mate, William R. King, won in a landslide – beating Winfield Scott by a 50 to 44 percent margin in the popular vote and 254 to 42 in the electoral vote. He became the youngest person elected to the presidency at the time. His good looks and inoffensive personality allowed him to make many friends, but he did not do what was necessary to avoid the impending American Civil War. Pierce's popularity in the northern United States decreased immensely after he expressed interest in the Kansas-Nebraska Act, repealing the Missouri Compromise and reopening the question of the expansion of slavery in the western United States. Pierce's credibility was further damaged when several of his foreign ministers issued the Ostend Manifesto. Abandoned by the Democratic party, he failed to be nominated for a second term and was replaced by James Buchanan as the Democratic candidate in the 1856 presidential election. Tragedy seemed to follow the Pierce family. Franklin and his wife Jane had three children. Two died in childhood. Then on Jan. 6, 1853, two months before the inauguration, the Pierces were in a train wreck and saw their third child, 11-year-old Benjamin, crushed to death. Jane became a recluse and throughout the administration declined to participate in public appearances. Franklin Pierce was born in a log cabin near Hillsborough, New Hampshire. Pierce's father was Benjamin Pierce, a frontier farmer who became a Revolutionary War soldier, state militia general, and two-time governor of New Hampshire. His mother was Anna Kendrick. Pierce was the seventh of eight children; he had four brothers and three sisters. Pierce attended school at the Hillsborough Center and moved to the Hancock Academy in Hancock, New Hampshire at the age of 11. He was later transferred to Francestown Academy in the spring of 1820. Later that year he was transferred to Phillips Exeter Academy to prepare for college. In the fall of 1820, he entered Bowdoin College in Brunswick, Maine, where he participated in literary, political, and debating clubs. At Bowdoin College he met writer Nathaniel Hawthorne, with whom he formed a lasting friendship. He also met Henry Wadsworth Longfellow, Calvin E. Stowe, Sergeant S. Prentiss, and his future political rival, John P. Hale. In his second year of college, his grades were the lowest in his class; he changed his habits and graduated in 1824, third in his class. After graduation, in 1826, he entered a law school in Northampton, Massachusetts studying under Governor Levi Woodbury, and later Judges Samuel Howe and Edmund Parker, in Amherst, New Hampshire. Pierce began his political career in 1828 when he was elected to the lower house of the New Hampshire General Court, the New Hampshire House of Representatives. He served in the House from 1829 to 1833, and acted as Speaker of the House from 1832 to 1833. Pierce was elected as a Democrat to the Twenty-third and Twenty-fourth Congresses (March 4, 1833 – March 4, 1837). He was only 27 years old, the youngest representative at the time. He was elected by the New Hampshire General Court as a Democrat to the United States Senate, serving from March 4, 1837, to February 28, 1842, when he resigned. He was chairman of the U.S. Senate Committee on Pensions during the Twenty-sixth United States Congress. After his service in the Senate, Pierce resumed the practice of law in Concord, with his partner Asa Fowler. He was District Attorney for New Hampshire and declined the appointment as Attorney General tendered by President James K. Polk. On November 19, 1834, Pierce married Jane Means Appleton (1806 – 1863), the daughter of a former president of Bowdoin College. Appleton was Pierce's opposite in almost every sense of the word. She came from an aristocratic Whig family and was extremely shy, deeply religious, often ill, and pro-temperance. Mrs. Pierce disliked life in Washington, D.C., and encouraged Pierce to resign his Senate seat and return to New Hampshire, which he did in 1841. They had three children of which two died in childhood; Franklin Pierce, Jr. (1852) in infancy and Frank Robert Pierce (1839 – 1843) at the age of four from epidemic typhus. Benjamin "Bennie" Pierce (1841 – 1853) died in a tragic railway accident at the age of 11, two months before the inauguration of his father. Pierce enlisted in the volunteer services during the Mexican-American War and was soon made Colonel. In March 1847, he was appointed Brigadier General of volunteers and took command of a brigade of reinforcements for Winfield Scott's army marching on Mexico City. His brigade was designated the 1st Brigade in the newly created Third Division and joined Scott's army in time for the Battle of Contreras. During the battle he was seriously wounded in the leg when he fell from his horse. The Democratic Party nominated Pierce as a "dark horse" candidate during the Democratic National Convention of 1852. The convention assembled on June 12 in Baltimore, Maryland, with four competing contenders. Stephen A. Douglas, William Marcy, James Buchanan and Lewis Cass vied for the nomination. Most of those who had left the party with Martin Van Buren to form the Free Soil Party had returned. Prior to the vote to determine the nominee, a party platform was adopted, opposing any further "agitation" over the slavery issue and supporting the Compromise of 1850 in an effort to unite the various Democratic factions. When the balloting for president began, the four candidates deadlocked, with no candidate reaching even a simple majority, much less the required supermajority of two-thirds. On the thirty-fifth ballot, Pierce was put forth as a compromise candidate. He had never fully articulated his views on slavery, which allowed him to be acceptable to all factions. He also had served in the Mexican-American War, which allowed the party to portray him as a war hero. Pierce was nominated unanimously on the forty-ninth ballot on June 5. Alabama Senator William R. King was chosen as the nominee for Vice President. Pierce's opponent was the United States Whig Party candidate, General Winfield Scott of Virginia, whom Pierce served under during the Mexican-American War, and his running mate, Senator William Alexander Graham of North Carolina. The Democrats' slogan was "We Polked you in 1844; we shall Pierce you in 1852!," a reference to the victory of James K. Polk in the 1844 election. This proved to be true, as Scott lost every state except Kentucky, Tennessee, Massachusetts, and Vermont. The total popular vote was 1,601,274 to 1,386,580, or 51 percent to 44 percent. Pierce won 27 of the 31 states, including Scott's home state of Virginia. John P. Hale, who like Pierce was from New Hampshire, was the nominee of the remnants of the Free Soil Party, garnering 155,825 votes. The election of 1852 would be the last presidential contest in which the Whigs would field a candidate. 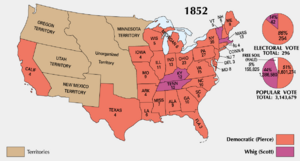 In 1854, the Kansas-Nebraska Act divided the Whigs, with the Northern Whigs deeply opposed, resulting in a split between former Whigs, some of whom joined the nativist United States Know-Nothing Party, others the Constitutional Union Party, and still others the newly formed Republicans. Pierce served as U.S. President from March 4, 1853, to March 3, 1857. Two months before he took office and shortly after boarding a train in Boston, Massachusetts, president-elect Pierce and his family were trapped in a derailed car when it rolled over an embankment near Andover, Massachusetts. Pierce and his wife survived and were merely shaken up, but they watched as their 11-year-old son Benjamin ("Bennie") was crushed to death in the train disaster. Grief-stricken, Pierce entered the presidency nervously exhausted. The family had already lost two children to typhus, and Jane Pierce believed the train accident was divine punishment for her husband's acceptance of the high office of the presidency. As a result, Pierce chose to "affirm" his Oath of Office on a law book rather than the Bible, becoming the first president to do so. Pierce is one of only three presidents to "affirm" the Oath of Office, the two other being Herbert Hoover, who chose to "affirm" rather than "swear" because of to his Quaker beliefs, and John Tyler. In his inaugural address, he proclaimed an era of peace and prosperity at home and vigor in relations with other nations, saying that the United States might have to acquire additional possessions for the sake of its own security and would not be deterred by "any timid forebodings of evil." Pierce aroused sectional apprehension when he pressured the United Kingdom to relinquish its special interests along part of the Central American coast, and when he tried to persuade Spain to sell Cuba for 100 million U.S. Dollars because of the expansive sugar crop in Cuba. The release of the Ostend Manifesto, signed by several of Pierce's cabinet members, caused outrage with its suggestion that the U.S. seize Cuba by force, and permanently discredited the Democratic Party's expansionist policies, which it had so famously rode to victory in 1844. Secretary of War Jefferson Davis, advocate of a southern transcontinental route, had persuaded Pierce to send James Gadsden to Mexico to buy land for a southern railroad. He purchased the area now comprising southern Arizona and part of southern New Mexico for 10 million U.S. Dollars commonly known as the Gadsden Purchase. The passage of the Kansas-Nebraska Act brought about a sequence of events that developed into “Bleeding Kansas”. Pro-slavery “Border Ruffians”, mostly from Missouri, illegally voted in a government that Pierce recognized and called a shadow government set up by “Free-Staters” an act of rebellion. Pierce continued to recognize the pro-slavery legislature even after a congressional investigative committee found its election illegitimate. He also sent in federal troops to break up a meeting of the shadow government in Topeka, Kansas. The Act also caused widespread outrage in the northern U.S. and spurred the creation of the Republican Party, a sectional Northern party which was organized as a direct response to the bill. The election of Republican Abraham Lincoln would provoke secession in 1861. Meanwhile, Pierce lost all credibility he may have had in the North and in the South and was not re-nominated. After losing the Democratic nomination, he returned to New Hampshire. During the American Civil War, Pierce damaged his reputation by declaring support for the Confederacy, headed by his old cabinet member Davis. One of the few friends to stick by Pierce was his college friend and biographer, Nathaniel Hawthorne. This page was last modified on 8 May 2017, at 22:24.